coldlogic | The Ego Co.
Yeah I know you’ve seen this look before, but its the only thing I had to fit the theme. So today I have 3 things from Around the World. If you haven’t gone you should. Sway’s Yuka Asian Relaxation Set is one of the first things I wanted to blog from ATW. The set comes with the cushions, table, table accessories and the plant. There is a screen also in green, but I didn’t see it when I bought so I went to the store and got a pink one to make my top. Ziau’s Geta sandals went perfect with the asian theme and lastly I’m using a pose from the Purple Poses Kate set. Hello, I have to tell you: tomorow starts a new fabulous event called “Arround the world” and I couldn`t wait to show you a few previews. Please keep in mind that I can`t put slurl yet, but don`t worry coz tomorow I will update this blogpost. PXL is releasing very soon a new line of skins called Sophia and it`s having a small pre-release in two tones (Sunkissed and Olive ) for this event. In rl I am addicted to UGG, so you can imagine how I was when I saw this lovely ones from Intrepid and will be available at “Arround the world”. By the way I had to edit a little between ankles because this gorgeous jeans from Meli Imako are capri and the cuffs was slightly showing trough Ugg`s. Oh and if you didn`t notice this jeans are mesh, I love The fact that they are ripped on the knee. I do not know very much about art, I still draw like a 7 year old child, but I do apreciate and Lilly Juno has told me a few things about her last release “Starry Night”. This set was made in honour of Van Gough, most people think he went crazy cause he cut his ear off but back in 1500s – 1600s they didn’t know much about things like ear infections and ringing in the ear. In that time he was in the hospital he painted some of his best work, 52 paintings before he died in that year, also he painted “Starry Night” one of his most famous piece. PXL Sophia – Sunkissed ( Cherry Lips ) – Smokey Eyes > Arround the world ! Intrepid Aussie Ugg – Tan > Arround the world ! !Bang Strenght Poses > Arround the world ! Prime Mamani Coffee ( from Mamani Set ) > Arround the world ! Good afternoon !! The first thing you have to notice is that I wear black hair, I usually wear blonde, brown or red, the reason is that black hair makes me think it`s making me look more older or harshes my face and it`s not really defining me. But this hair Mochi from Yulicie is so cute with a bow that changes colors, another thing I wear very rare is short hair, but again this is a sweet and playful one. ColdLogic has recently released a new line of coats just perfect for autumn, my favorite one is Atwell on cream. PXL Face Freckles – light new!! Yulicie Mochi – Black new!! ColdLogic Coat “Atwell” – Cream new!! If you haven’t checked out the Summer Harvest Hunt you definately should take a look at this page for hints and pics of the hunt items. 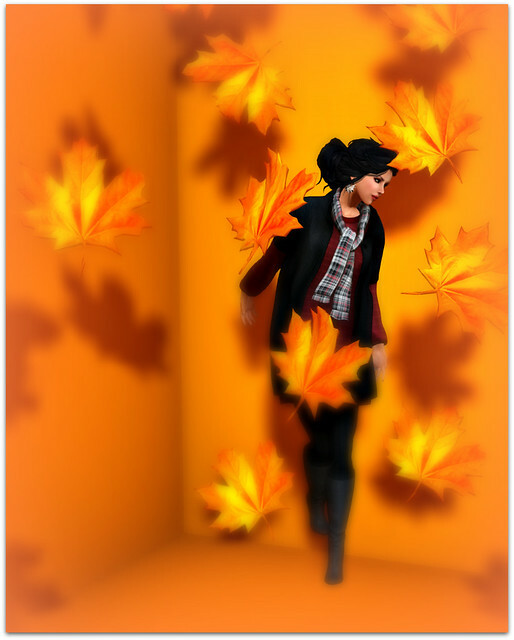 Bent has a cute autumn pose prop call the Summer Harvest Hunt available. Its 6 poses inside with falling leaves. The poses are well done and most work well with mesh dresses and long tops. If you are on a tight prim budget make sure you have at least 40 prims to rezz this pose prop. The Summer Harvest Hunt, hosted by The Ego Co., starts in just a few days!! For the starting point and a list of participating stores, click here!